Moringa Deep Conditioning treatment does a supreme scalp stimulation and deeply penetrates and moisturizes dry, damaged, brittle, and/or over-processed hair and gets a healthy shine.The combination of Moringa oil with the blend of theraupatic organic carrier oils in this green gold potpourri will nourish,soften and helps strengthen roots for supreme hair growth. How to Use - For an intensive treatment, massage generous amount of the oil into scalp and hair, cover with a shower cap and leave on for at least an hour. The longer you will let this oil soak in to your hair, the better the results. 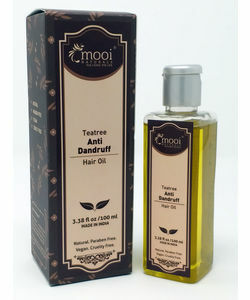 Shampoo or rinse out as desired.Use this oil twice a week for up to 4 weeks for good results. 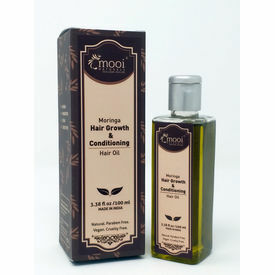 Moringa Deep Conditioning treatment does a supreme scalp stimulation and deeply penetrates and moisturizes dry, damaged, brittle, and/or over-processed hair and gets a healthy shine.The combination of Moringa oil with the blend of theraupatic organic carrier oils in this green gold potpourri will nourish,soften and helps strengthen roots for supreme hair growth. How to Use - For an intensive treatment, massage generous amount of the oil into scalp and hair, cover with a shower cap and leave on for at least an hour. The longer you will let this oil soak in to your hair, the better the results. 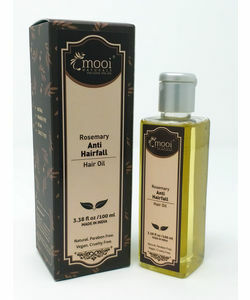 Shampoo or rinse out as desired.Use this oil twice a week for up to 4 weeks for good results. Disclaimer : Always recommend to do a patch test for compatibility prior to using any new products. All of Mooi Naturals products are vegan and cruelty free and do not contain either synthetic ingredients or ingredients of animal origin.